Behold That Star arranged by Philip Kern. For Choral (SATB). Shawnee Press. Choral. 12 pages. Shawnee Press #A2240. 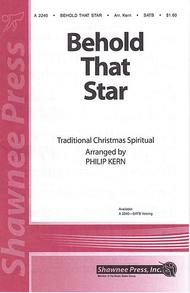 Published by Shawnee Press (HL.35001888).This traditional spiritual has been set by Phil Kern as a follow-up to his wonderful arrangement of “Rise Up, Shepherd.” A strong piano accompaniment is paired with full vocals that range from forte harmonies and legato unisons to quiet a cappella sections. Even hand claps are incorporated and the entire piece builds to a rousing final chord that your audience and singers will thoroughly enjoy and appreciate.